I love Cook’s Illustrated and have many of their cookbooks. 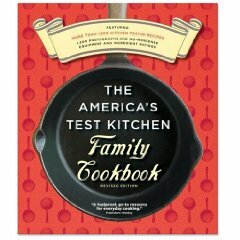 My favorite cookbook that they have done is the The America’s Test Kitchen Family Cookbook . It is one of the most used cookbooks in my collection. I love this cookbook because it contains basic everyday recipes. Many of these recipes have become favorites in my family. Because this is one of my favorite cookbooks, I wanted to tell you about the great price Amazon has on the The America’s Test Kitchen Family Cookbook right now. If you are looking for a some new inspiration in the kitchen, this cookbook would be a great place to start. This book would also make a great gift for someone who loves to cook or for someone that is new to cooking. You might also want to check out Cook’s Illustrated’s new slow cooker cookbook, The Slow Cooker Revolution . I ordered a copy of it last week from Amazon and I can not wait to get it. It is also a great price right now, and if it is anything like their other cookbooks, it will definitely become a favorite it of mine. I can always use new inspiration when it comes to using my slow cooker and I am looking forward to seeing what this new book contains. And this is not becoming a deal blog, but when my friend Carrie told me about this great deal, I wanted to share it with you. Amen! I love that cookbook, and frequently give it as a wedding gift. And, my Slow Cooker Revolution cookbook should arrive today! I’m looking forward to see what they come up with for the slow cooker, knowing how great they’ve been at all other recipes. I love Cook’s Illustrated stuff. I love that they test and test and test all their recipes until they figure out the best way and then share it with us. It’s great! 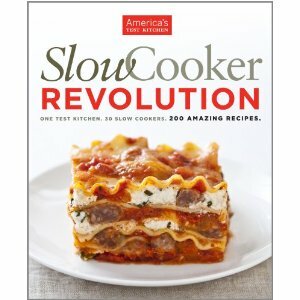 I can’t wait to hear what you think of Slow Cooker Revolution. I have been eying it! I love their Family Cookbook as well as the 2010 Best of. Please give a review when you get it!! You’ll have to let us all know what you think of their Slow Cooker Revolution. I am not a fan of most slow cooker cookbooks, but I could really use some new slow cooker recipes, so hopefully this one will be a winner! Thanks! I have two of their cookbooks (make ahead meals & skillet meals) and subscribe. They also have an awesome ipod app for anyone that has a touch/iphone. @Tricia, I did not know they had an iphone app. I am going to have to check into that.